McCain sharpened his criticism of Putin Tuesday. McCain’s comments came in an interview with Harrisburg public radio WITF, in which he hammered Putin for continuing to wield power since leaving the presidency behind earlier this year and installing his hand-picked successor, Dmitry Medvedev. He then accused Putin of wanting to restore Russia to the days of czardom, when a monarchy exerted broad control over parts of Asia and eastern Europe. Don't we have a war or two going on all ready? It aint going to work. All these fear mongering aint going to work anymore. Going to war is the solution to everything as far as Republicans are concerned. Bush was a war mongering president, and what did it get us? No more. It is time for change, Bush, McCain and the rest of the republican scum has to go. They are the reason we are in the mess that we are in. mccain you need to shut up.you are not president.you are only trying to capitalize off of the suffering of the people of the caucuses,to try to earn votes.your lobbyist buddy scheuneman and you were provoking russia,and now you are using the situation for political gain. Doesn't it bother anyone in the press or in politics that it was Georgia that fired the first shot and rolled in the first tanks, breaking a truce of over a decade? I'm by no means an apologist for Russia, but the lopsided and distorted coverage appears to be nothing more than an anti-Russian knee-jerk reaction. If we had held the British to the same level of responsibility in the Falklands, we'd have come down four-square for Argentina. Putin does have some explaining to do. If he had a ligitimate gripe,he should have informed the Powers that be,and told them his honest appraisal of the situation,before invading. See, I told you guys that McBrainless' attitude was not conducive to anything constructive. Instead of using prudence in an extremely delicate situation, this clowns looks to incite Russia. I don't know what he is expecting to accomplish with these remarks. In my opinion it further proves that he does not have the temperament to lead this nation. McBrianless' saber rattling is not going to make Russia succumb to his imagined authority. What does he think Russia is going to do, pack up and leave so McIdiot won’t think they're trying to re-establish their lost empire? How utterly stupid. What kind of administration would McBrainless have? With nonsense like this coming out of his mouth, just exactly how effective does he think he'll be? See, this buffoon has no idea how to lead on the world stage. All this posturing is only for the American electorate, that' s it. It shows how inept his administration will be. He doesn't even consider possible repercussions of statements like this. This, chuckles the clown, is definitely unfit to be President. Being president requires commonsense and a keen insight on how to deal with international problems, not waving a big stick and talking loud. Besides, if Russia wanted to they could say the thing about us for invading a nation unjustifiably. McBrainless is an absolute idiot, being advised by equally stupid people. Saber rattling is not the answer, McWizard. Why is it that the USA can march into any country it wants for any reason, such as to protect US citizens, as we did in Grenada, Panama, Serbia, Iraq, and that the USA can support and recognize separatist movements, such as in Kosovo, but we get so upset when any other country does the exact same thing? We are hypocrites and the rest of the world knows it, which is why we have less influence in the world and must rely on empty, saber rattling bluster from people like McCain who is impotent to doing anything about it. What...and the US isn't interested in empire building...? Give me a break. Our leaders and the TV pundits who are suddenly international relations experts need to read some history books. Russia is not easily understood or judged. Russian history is highly complex, more so than the average American intellect can comprehend. Since 1918 their foreign policy has been dominated by fear of encirclement by the west (following two catastrophic invasions from the west). Look at how we are expanding NATO. Our goal is to encircle Russia and prevent Russian resurgance. They are working to prevent/undermine this strategy. The Baby Boomers will indeed be the end of the world. If they have to sink the earth to have their selfish narrow minded way and send their own grandkids into war they are fine with it. Sick. 1.McCain has not acknowledged the reports and eyewitness testimony that the Georgian army were shooting women and children. 2. Jumping to conclusions so fast with such strong rhetoric before the facts that are only now coming out shows a grave warning to what McCain would be like as president. 3. Calling for Russia to be removed from the G8 prior to all these events serves to only antagonize Russia (granted after their use of excessive force this maybe be a good idea). However, this only plays into the Russian's belief that the US is not a fair broker in international affairs. 4. McCain coming out with such strong anti-Russian rhetoric, his jokes at his town hall meetings, mispronouncing Mikheil Saakashvili's name and calling Putin president instead of prime minister all sends very bad signals to Russia and to the region. 5 McCain needs to bare in mind that Russia's support is required to keep Iran from developing nuclear weapons and to stop it's influence in Iraq. McCain is burning bridges. A foreign policy blunder beyond belief. Also: The headlines 'Obama moves to Mccain's stance on Russia' is very misleading. McCain started with a biased view on Russia and didn't wait for facts before starting the blame game. Obama on the other had showed a far better response, stating both sides had to refrain from use of force and then only when there was proof that Russia had over extended itself did he beef up the rhetoric. This is what America needs in a president. A calm informed balanced response, not a biased two dimensional thinking war mongered. Putin is dangerous and so is McWar. Mixing two volatile ingrediants is a good way to make an explosion. They both scare me but of the two, MCBush has the hot temper and acts before he thinks. Killed the free press, imprisoned or murdered the opposition and consolidated his "party" (read: old KGB + media & commodity control = fascism) power into a functioning dictatorship. That's a lot different from the US. The free press here has killed itself by not doing its job by vetting Obama the way it would have vetted any other first year Senator who decided to run for POTUS. The difference here is that the opposition is being imprisoned by the press and Obama supporters and surrogates with racism charges for anyone who disagrees with him. 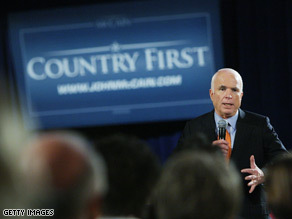 And didn't Obama just take a jab at McCain for OPPOSING "commodity control"? Remember, McCain opposed governement mandated purchases? I WRITE IN ALL CAPS BECAUSE I'M MAD!!!! This man wants to start another senseless war somewhere else now! good Lord!!!! !